The advertising market dropped 1.4% in 2011 to $13.5 billion after a 7.4% increase in 2010, according to the Commercial Economic Advisory Service of Australia (CEASA). The drop was driven by declines for some of the highest grossing media including television, down 2.6%, metropolitan and national dailies, down 9.2%, and magazines, down 8.4%, but tempered by strong performances from online which saw a 17.5% increase, outdoor with a 3.4% increase and radio with a 0.7% increase. Cinema posted the largest decline with a 20.8% decrease, while classified directories dropped 11.3%. Subscription televisions fared better than free to air, posting a 3.6% increase, while metropolitan free to air dropped 3.7% and regional fell 1.6%. 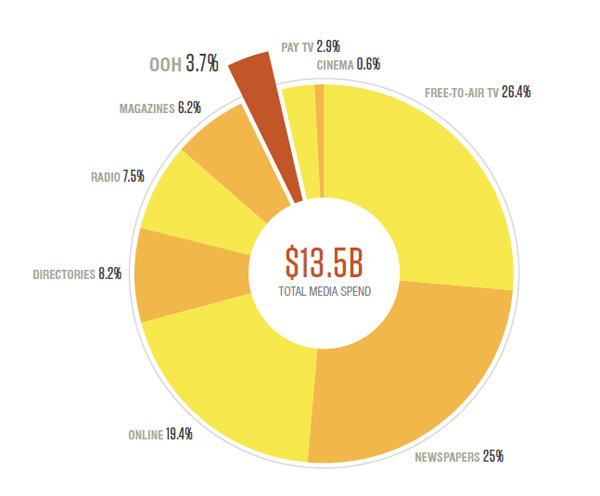 Despite the decline, free-to-air TV retained the largest share of spend for 2011, taking 26.4% of the market to edge out newspapers at 25%. CEASA chief executive Bernard Holt says that while the market declined, the drop was not as bad as declines experienced in the past.